1.3 What are the benefits of oatmeal porridge? 1.5 What kind of oats is best to buy to prepare porridge? 1.11 Is porridge good for dinner? 1.12 Replace cereals with oatmeal? Porridge is a traditional recipe that is usually consumed at breakfast. 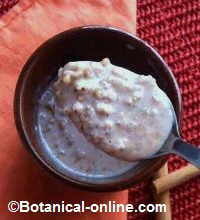 It can be made in many ways, the most typical porridge being oatmeal, also called oat porridge. Other times the porridge is prepared with another base food, such as millet, rice, quinoa, teff, buckwheat or cassava. Porridge is the English word for this type of preparations, consisting of a type of thick, lumpy mash, typically made with cereals heated in milk. What are the benefits of oatmeal porridge? Oat porridge is a sweet recipe very energetic, nutritious and, in addition, delicious. It can be prepared in many ways, since the recipe accepts many variations: with fruit (apple, banana, etc. ), dried fruit (raisins, prunes, coconut, etc.) or with different aromas and flavors (with cocoa, vanilla, cinnamon, etc.). – Rich in Protein: Did you know that oats are the most protein rich cereal? A serving of porridge with milk or soy drink can provide about 10g of protein, a considerable amount (equivalent to half of protein that provides a piece of meat, or twice as much protein as a yogurt). – Slow-absorption carbohydrates: As many readers know, oats are rich in carbohydrates (60%), which are energy for easy digestion. – Very rich in fiber: oats also contain a lot of fiber, which slows the digestion of carbohydrates and causes the porridge to have a lower glycemic index than other breakfast cereals. This improves control of blood sugar, which is beneficial for all people, especially good for obesity, diabetes, and people with constipation. – Rich in B vitamins: both oats and milk are foods rich in B vitamins. These vitamins are necessary for energy and for the brain to function properly. – Rich in minerals: Oats are a whole cereal, therefore, they conserve the majority of minerals that are lost during the refinement of cereals: They are rich in phosphorus, potassium, calcium, magnesium, iron (5mg per 100g) and zinc. What kind of oats is best to buy to prepare porridge? The best porridge to prepare porridge are fine flakes, soft flakes or thin oat flakes (oats for atole, oatmeat or porridge), which are split oat flakes that look thinner than whole flakes. Being fine, split grains, these are not so hard and are easier to consume, cook and chew. Being thin flakes, they are easily hydrated and do not need to be soaked, thicken quickly and can be used as commercial breakfast cereals. If you buy the entire grain of oats, it is best to give it a soak before it softens, otherwise it is very hard to chew. It is not recommended to buy oat bran, which is pure fiber, hard and not tasty. Oat porridge provides energy of easy assimilation, with a lot of satiety, and, as we have seen in the previous point, it is a very nutritious recipe due to its content in proteins, vitamins of group B, phosphorus, potassium, magnesium, calcium, iron and zinc. It is a perfect breakfast or snack for all ages, children or adults. In fact, because of its properties, more and more people decide to substitute breakfast cereals for oats. It provides complex carbohydrates and fiber, which are absorbed gradually in the body, prolonging the feeling of fullness of meals. Oatmeal porridge is a very suitable recipe in weight loss diets, better choice than breakfast cereals or toast with butter and jam. This is because oats contain a high proportion of soluble fiber (betaglucans) which, in contact with water, increases in size and producess a feeling of satiety. This property is useful for people with food anxiety as it helps them to lessen the feeling of hunger. In addition, it has been proven that oat fiber helps to lower cholesterol levels. Oatmeal is a very popular food for slimming because, as a result of its properties, miraculous diets like the one that was popular Dukan diet began to recommend it. Because of its fiber content, oatmeal porridge is particularly interesting for people with constipation. On the one hand, oatmeal contains soluble fiber (beta glucans) and starches, which are fermentable and have a beneficial effect on the intestinal flora (prebiotic effect), which helps regulate the intestinal rhythm and improve chronic constipation. In addition, oats also have insoluble fiber, with more laxative properties, suitable for people with occasional or chronic constipation. As mentioned, oats are very good at helping to lower cholesterol, property that exerts its high fiber content. To do this, it is necessary to include oats within a healthy diet, which contains plenty of vegetables, such as lentils, chickpeas, salads, vegetable creams, seaweed, fresh fruits, sesame seeds, etc. In addition, to reduce cholesterol and improve heart health, it is necessary to avoid foods with added sugars, such as cookies, jams and sugar. See more about diet to lower cholesterol. Some readers ask us: is it good for diabetics to eat porridge if oats contain too many carbohydrates? Breakfast can include a variety of foods, with and without carbohydrates, for example: brown rice, whole wheat bread, avocado, whole fresh fruits (not juices), spinach omelette, etc. Oatmeal is a healthy option for diabetes, even though it contains many carbohydrates. The carbohydrates it contains are slow to digest, that is to say, after digestion it does not rapidly raise blood sugar, but it does so slowly and gradually. It has been verified that the glycemic index of the oats is low, inferior to the one of other processed cereals, being even better option than whole bread. This is because it is a whole grain cereal and its fiber content slows the absorption of carbohydrates. Is porridge good for dinner? There are no specific foods for each meal of the day, such as “breakfast cereal” (excluding commercial product advertising), “dinner vegetables” or “snack fruits”. Most people consume porridge as breakfast cereal, but it could be a suitable recipe as a dinner dessert or even a substitute for dinner, depending on each diet, as it should be valued globally. The truth is that there are other more nutritious dining options, but not for that, it is a worse option. * Related information: Is it good to have milk and cereal? Substituting industrial cereals by oatmeal is very healthy, since oats have less sugar, more fiber, and do not raise blood sugar so much. It is also a more nutritious option than any processed breakfast cereal. Of course, it is healthier than sugary or chocolate cereals. In short, oats are a perfect food to get energy in the mornings and that lasts until lunchtime without starving between hours. – Put all the ingredients in a pot, bring to a boil, without a lid. Once they reach the boiling temperature, lower the intensity of the fire and stir to thicken. – Serve in a bowl. It can be decorated with fresh or dried fruit (raisins, goji, banana, apple, etc. ), seeds or nuts. – Boil the milk, water or vegetable drink, in a pot. Once boiling, remove half a glass of liquid and set aside. – Add the oats and the banana in small pieces. Lower the intensity of the fire and stir to thicken. – In a cup, dilute the cocoa powder with the cinnamon, stirring well. 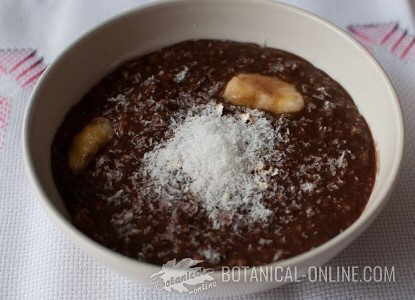 Pure cocoa is difficult to dissolve and it is best done in a cup, then add it to the porridge when there are not lumps. – Add the dissolved cocoa in the porridge pot. – Serve in a bowl. It can be decorated with coconut, seeds or other fruits.